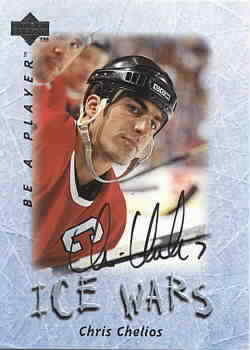 1996 Be A Player certified autograph card of former Chicago Blackhawks superstar Chris Chelios, who ordinarily refuses to sign cards. ONLY TWO AVAILABLE FOR SALE. With certificate of authenticity from AutographsForSale.com.